Proceed up the hill towards the Storm Tower. Pass the Storm Tower and continue on towards Efford Beacon. Continue forward keeping the sea on your right and you will reach Upton and pass some cottages on the left. Keep walking and pass through Phillips Point Nature Reserve after a while you will come down the hill towards the sandy beach of Widemouth Bay at the far end is Black Rock beach. Passing Black Rock beach continue on until you come to Wanson Mouth at this point you need to leave the path onto the road so watch out for traffic. 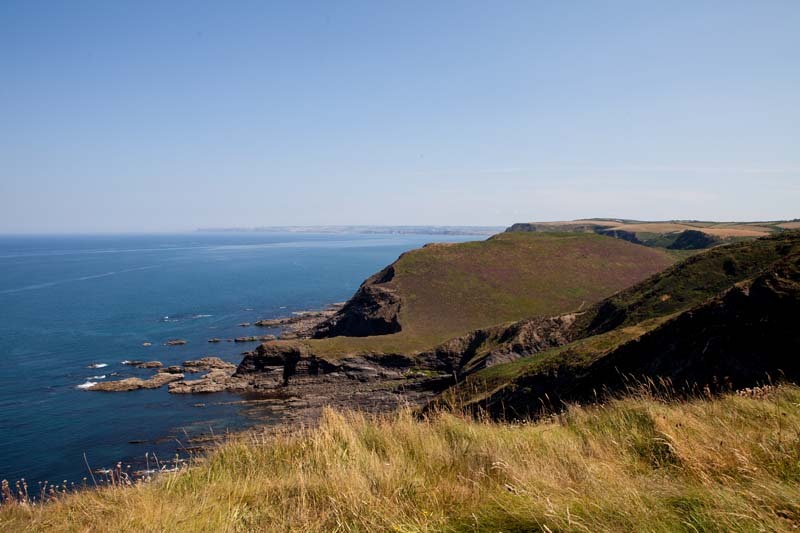 Pass Outdoor Adventure activity centre and re-join the coast path at the layby carpark on the top of Penhalt Cliff. The path then continues on towards Millock and its amazing rock formations, a good place to stop for a rest before continuing out of the valley up the hill. At Cancleave Strand take care of eroding cliffs and continue onto the wooded valley of Dizzard. The next valley is known locally at Butterfly Valley the stream at the bottom is known as Scrade water. Continue on the path to the high point know as Castle Point reputed to be the sight of an Iron Age Hill Fort. The next high point is Pencarrow then the final descent into the Crackington Haven.